This transcription was made from a poor xerox copy of the clipping contained in Ashmead's Cuttings (V97) at the Historical Society of Pennsylvania (Vol. 12, p. 33-36). I searched for this article on the microfilm in the Free Library of Philadelphia's excellent Periodicals Collection, to obtain a clearer copy, but was unable to find it for the date listed, or any nearby dates. In 2014 I returned to HSP to check the original, which allowed me to fill in the blanks that existed in earlier versions of the text. Pegg or Pegg's Run, north of Callowhill Street, with Delaware River on left. From Scot & Allardice Map of Philadelphia, 1794. Forgotten watercourses beneath the City of Philadelphia. Tributaries of the Delaware, once familiar, whose names only are now recalled. Under the streets and houses of this city courses many a stream which once sparkled and babbled along through the forest years before the white man had placed foot on the soil of the new world. The limpid waters once visited by the deer and panther have lost their sweetness and their beds have changed from the mossy banks in the woodland to the slimy walls of the sewer. Early maps show a great profusion of runs and small streams scattered over the country between the two rivers. The mind naturally reverts first to Dock creek, the Indian Cocanocan, the best known perhaps of any, its prominence being due to its location in the centre of the old city. Dock Creek was originally surrounded by marshes and the neighborhood was known as "The Swamp." The first bridge in the State was a wooden one over the creek at the Blue Anchor Inn, existing earlier than 1704. The main creek ran northwest under the present Dock Street to Chestnut, near Fourth street, thence almost direct north to High, where it culminated in a pond on the northwest comer of Fourth and High streets. This pond was deep and uninviting. Diverging from Dock creek at the present Girard Bank, Munday's run coursed through what was afterward called Beck's hollow, near Fourth and Walnut streets, thence by the old church in Fifth street, under the old Walnut Street Prison to Washington Square, then, of course, the Potter's Field. At that point was quite a large pond, and a small stream, starting near Tenth and Arch streets, passing under High, entered on the north side. Little Dock creek diverged from the main body at the southwest, opposite Blue Anchor Inn, and was navigable for canoes as high as St. Peter's Church, to which point the tide reached. The mouth of Dock creek covered the whole of Spruce street east of Second, and its outlet extended along the base of Society Hill nearly to Union street. Little Dock creek after being covered was known as Little Dock street until recently, when the name was changed to Mattis street. Penn decreed that the water east of the mouth of Little Dock creek should be a harbor forever. His wishes have not been complied with. The inconvenience of an open waterway in the city soon made itself felt and before long bridges or, more properly, arches were placed over it, though at one time there was a landing for boats at Fourth and High streets. In 1713 there was a bridge over the creek at Second street, which was rebuilt in 1720 at a cost of 125 [pounds]. A stone bridge was erected at Third street in 1740 at a cost of 79 [pounds]. A bridge was built at Walnut street which existed in 1767. Above Third street there was an arch about what is now the junction of Hudson and Chestnut streets, built in 1719. Logs from the Third street and the Chestnut street bridges have been unearthed in the present century. It would seem that those bridges above Third street were almost continuous, so that Dock creek was more or less covered above that point, when, in 1784, the work of burying the whole stream was begun. The sewer was made of logs framed together and planked, then covered by an arch. Where the old Exchange building stands was a tanyard. Mention is made of a high foot bridge over the creek to Society Hill at a very early date, which was sufficiently elevated to allow small vessels to pass underneath without lowering their masts. For many years after the creek was covered over the neighborhood was known as the "Drawbridge," and as late as 1834 we read that the Drawbridge lot rented for $600 per year. About this time the Columbia Railroad was laid through the street. There are many reminders left of the old waterway. In excavating for the foundation of the new insurance building on the northwest comer of Fourth and Chestnut streets in the fall of 1888, the sewer walls were broken into, and the running water of the creek was visible. The builders were compelled to make a foundation of iron pillars instead of stone, and the extra cost is said to have been more than $20,000. At one time Little Dock creek flowed from the Blue House pond at Ninth and South streets, and Watson states that boys skated from the pond to the river. A wooden bridge carried Second street over this creek and at this point was located the Bathsheba baths, a famous resort in colonial days. Whitfield preached near by in the open air. Within the past few months the Pennsylvania Warehousing Company have been excavating the lot at Spruce and Water streets, preparatory to building a storage house. Several old buildings have been torn down and their cellars have been dug much deeper. In doing this several feet of made ground have been passed through and then a heavy platform of square timbers has been unearthed. Beneath this the ground is very marshy, so that a large pumping engine is constantly employed throwing out a three-inch stream of water. It seems evident that this is creek water and not from the Delaware. The value of this lot, facing 100 feet on Delaware avenue, was $250,000 a few months since. A century ago, when it was swamp, it is doubtful whether it could have been sold for $250. In 1740 the beach here was a common landing free to all. An occasional glimpse can be caught of the walls of the sewer covering the creek. Less than two months ago the side of the arch was exposed at Front and Dock streets in laying a drain. The outlet of the creek can yet be seen from the river under the fish market. Next to Dock Creek the most prominent water course was Pegg's run, or Cohoquonoque creek, now covered in part by Willow street. While not approaching Dock creek in point of size, Pegg's run was much used by our ancestors, there being wide meadows and cornfields along its banks, and the farm products were floated down to the city front on flat boats. Then, too, it was a favored resort for young folks, who were accustomed on moonlight nights to row up as far as the famous Spring Garden spring. The exact location of this spring is not known, though Watson claims to have seen it in the cellar of a house 100 feet east of Ninth street on Garden street near to the entrance to a sewer. The run took its name from the Pegg family, who resided near by in 1709. Scull's map of 1750 shows the run as extending as far west as Broad street, though it is certain it reached much further. But three houses are shown along its banks and they are all marked Stinyard [this may be a typographical error; possibly tanyard, not stinyard]. A map dated 1762 shows a branch of the creek reaching nearly to Centre or Penn Square. In 1795 there was a wide slip east of Front street, and the run was then crossed by Front, Second, Third, Fourth and Eighth streets. This map shows the creek as bending south at Tenth street. Below Callowhill, which it recrossed near Thirteenth, continuing thence northwest to Bush Hill. In 1811 the run had been covered as far west as Franklin street, and in 1824 to Ninth street. It is the location of this creek which renders impracticable the scheme of placing the Willow street tracks underground. A century ago Poole's bridge over the run at Front street was a great converging point, and the citizens were proud of the structure. We are told that the land on both sides was low and swampy, and that several people straying from the causeway on which Front street was carried lost their lives in the mud. Under the causeway were sluices to permit free flowing of the water, the road and bridge being some three hundred feet nearer the Delaware than the present crossing of Front and Willow streets. There are not wanting those who contend that Pegg's run was at one time the bed of the Schuylkill when it left its present course above Fairmount dam and flowed almost directly east. 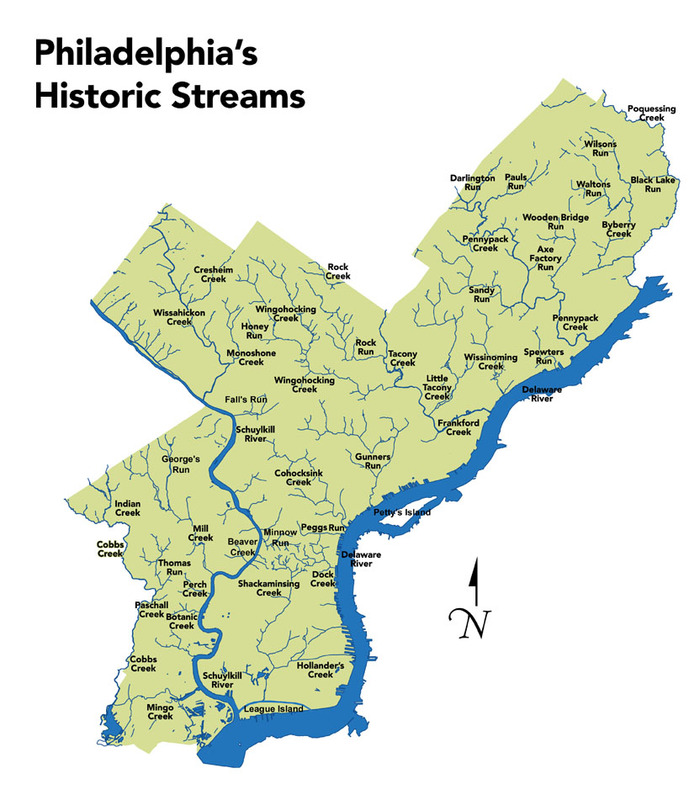 Geologists tell us further that at a still earlier date the Schuylkill did not flow south of the Falls, but running eastwardly fell into the course of the Cohocksink creek, and emptied into the Delaware many miles above its present mouth. Though Cohocksink creek has been buried for twenty years, every schoolboy knows its whereabouts, for it seems determined not to be shut in from the light. The arching over of Dock creek and Pegg's run was but child's play compared with the task of burying this stream. Every rain-storm swells the creek to a flood, and only as late as July 31 there was a very serious break on Germantown avenue, below Second street, which will require thousands of dollars to repair. Other recent breaks have been at Franklin street and Montgomery avenue and at Eleventh and Diamond streets. Much more than a century ago this creek played an important part in the history of the city. It was crossed by Frankfort (now Frankford) and Germantown roads, both much traveled thoroughfares. Penn's famous Globe Mill stood below Third street near Thompson, the dam being west of Fifth street, a long mill-race north of the creek connecting the two. The mill was largely resorted to by farmers around the city, the greater part of the grain being carried thither by boats. The land route was dangerous on account of the swamps bordering Pegg's run and also in the vicinity of the mill. The dam was the fashionable skating pond long ago, and the ancestors of those who glide over the ice at Fairmount cut many a caper where now only row after row of houses can be seen. Above the dam the creek divided, the main portion running west finally turning to the north, the other branch continuing directly north. In 1795 huge marshes existed as far as Front street and a branch of the creek stretched to the house of I. Meredith, about Front and master streets. In excavating for the Church of the Messiah, at Broad street and Montgomery avenue, the bed of the creek was struck and the ground was so wet and soft that the builders were compelled to sink fifty-four heavy stones thirty' feet into the earth and then spring arches upon which to erect the ordinary foundation. The extra cost was over $10,000. Smedley's map of 1862 shows the creek as being open east of Laurel street and northwest of Sixth street and Columbia avenue. It is probable that with the improvements now being made the frequent breaks will cease and the raging Cohocksink will be as securely tied down as are the water -courses already spoken of. Frankford creek exceeds in size all other streams within the city limits, though of course it was far from the town as Penn laid it out. Gunner's run, as shown on Scull's 1750 map, is now converted into the Aramingo Canal as far as Cedar and Clearfield streets, west of which it still pursues its sluggish way. It can be readily traced as far as Fifteenth street and Westmoreland avenue. The canal, which has perfumed the atmosphere for more than three decades, will soon be a thing of the past, and the entire course from the Frankford creek to the [Kensington] Water Works will be converted into an immense sewer. The run proper will meet a like fate and two more buried waterways will be added to the list. Frankford creek drains a large section of country, Little Tacony creek emptying into it near Frankford Junction, while at Fisher's lane the stream divides, the branches being known as Big Tacony and Wingohocking creeks, the former coming from the country north of the city limits, the latter flowing through Germantown from beyond Mount Airy. The [Wingohocking] creek is many miles in length, and has been utilized for mills since very early times. In 1750 Busby's mill stood near the forks, and Robert's well-known mill was below Logan's place, Stenton, while still further up the stream were a number of others. The foregoing are all the creeks of consequence emptying into the Delaware. While but a small number are tributary to that river it will be noticed that there are all of large size and of importance, while along the Schuylkill we find the Wissahickon is the only large stream, Mill's or Maylandville creek, emptying below Woodland cemetery, being second in size. Though but a few years since there were numerous runs tributary to the smaller river. In 1750 one Robeson lived where the Ridge road forded the Wissahickon, the distance from the old South House, at Second and High streets, being given on the [Scull's] map as 6.3 miles. It is not our intention to speak at length of this creek. Fortunately, it has been spared to us in all its pristine loveliness, and it is now unlikely that it will ever lose its beauty. It may not be generally known that Benjamin Franklin named this stream as the base of supply for drinking water in his will dated June 23, 1789, in which he left 100,000 [pounds] to the city for the purpose of creating water works. In the map of 1750 is shown a small creek, unnamed, emptying into the Schuylkill at the Falls and running east nearly to Germantown road, a saw mill being indicated at its mouth and Sickle's mill at Ridge road ford. In 1795 the map represents it as much smaller, not even reaching to the ridge. On the latter map a small stream is shown along Lemon Hill running north, which has entirely disappeared. Another coursed northeast from nearly the same spot to Tench Francis' place. On the south side of Fairmount another small creek ran, while a larger one emptied between Vine and Callowhill streets, flowing from Twentieth street. Small runs starting on both sides of Bush Hill met about Nineteenth and Arch streets and emptied into the river at Cherry street. This was quite a well-known stream, and Proud, the historian, speaks of it with much praise. The 1811 map shows a large bay from Cherry to High streets, into which the creek opened. All this neighborhood has changed wonderfully within the past few years, and the eastern bank of the river has been transformed since the railroad tracks were placed there in 1885. No signs now exist of the brook. Maylandville creek flowed past Hamilton's house long before the cemetery was thought of, and ten decades ago Darby and Cobb's creeks were lined with mills. On the eastern shore of the Schuylkill, below Market street, no streams are shown on early maps worth mentioning as far down as the river's mouth. We then find Sneake's, Matsey, Rogue Tincy and River's creeks, while Hollander's creek has many branches, among which are Ship, Shakhem and Davis. Turner's house, a well known colonial residence, stood on the banks of this creek, near where it is now crossed by Board street. Hannis' house, three and one-tenth miles from the old Court House, is still standing. Surveyor Smedley's map of 1861 shows a branch of Hollander's creek running as far north as Broad and Morris streets. It can still be traced below Sixteenth street and Passyunk avenue. "Philadelphia in 1824" contains a map showing this run starting about Broad and Lombard streets, thence to Thirteenth and South streets, to Tidmarsh (Carpenter) street near Twelfth, to Prime street and Shippen lane, and thence zigzag to Broad street, crossing Buck road east of Broad street near Dickinson, beyond that point running toward the southwest. In addition to the old-time water-courses it will be interesting to note the location of ponds in the city limits now gone and forgotten. Blue House pond has already been mentioned as well as one at Fourth and high streets. There were also deep ponds near Eighth and Arch, another called Everly's near Seventh and Arch; Evans', on the north side of Race street; Kinsey's, on the south side of High, above Miner street, near Robert Morris' house; one of the west side of Third street, above Pine, and Neville's pond, between Fourth and Fifth streets, extending from Spruce street to St. Mary's Church. In addition to these there were a score of ponds in he country west of Tenth street, which gradually disappeared as the city grew in that direction.